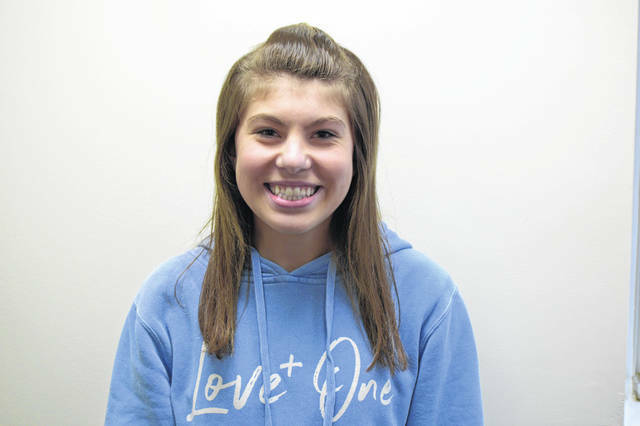 OTTOVILLE — Kambrie Edelbrock, 17, a senior at Ottoville High School, has thrived, despite a host of medical issues she’s had to deal with from a young age. When she was 11, she was diagnosed with pituitary dwarfism but through a series of growth hormone treatments, she developed normally. “I wasn’t getting enough growth hormone. So for about five years, I would take a shot every night,” she said. At age 12 she was diagnosed with Crohn’s disease, an inflammation or scarring of the intestinal tract. “That’s more affecting me now. I wasn’t getting enough nutrients to grow, so with both of those on top of each other I wasn’t the best,” she said. Despite all of this, she’s an inspiration to others, participating in cheerleading, volleyball, National Honor Society, Big Brothers Big Sisters, band, flag corps, and various high school musical performances. She’s already set her goals for after high school. “I’m almost positive about the University of Findlay in either diagnostic medical stenography or nursing,” she said. Her experiences with her health prompted her to explore a career in the medical field. “I’ve had a lot of health problems so just I’ve been around a hospital setting a lot and think that will be a good fit for me,” she noted. Dealing with Crohn’s disease has caused some problems with her studies. “I’m out of school a lot for doctor appointments, but something I’m proud of is that I never really missed a day of school unless it was for a doctor’s appointment or a procedure or something,” she said. “Kambrie hasn’t had the easiest path to get through things. With the medical condition she has, she has a lot of appointments and those type of things with that. She’s a very, very good student. She works extremely hard. Just a unique situation and I know that she’s got friends from other schools that have similar ailments. They’ve become very close, so it’s a kind of a different path as far as some people do it through music and get friendships. This is through maybe a medical thing that is wrong with each of them that they have to deal with, whether through a daily basis that a lot of students or people in that matter don’t have to,” said Jon Thorbahn, principal at Ottoville High School.